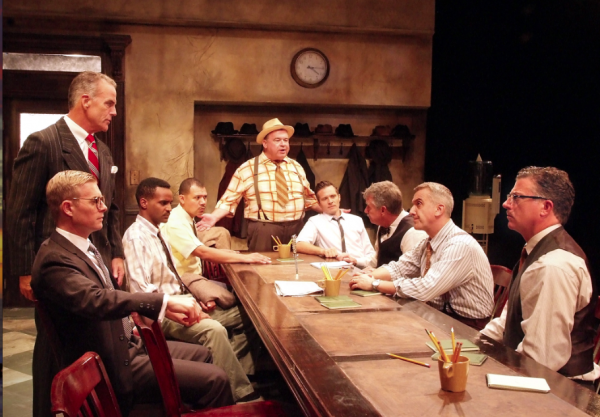 The Laguna Playhouse production of “12 Angry Men” stars an ensemble cast of veteran stage and television actors. Recently, nine neighbors (including me) who frequently meet with our dogs at a local park left our pooches at home and made the trek to Laguna Beach to enjoy a production of the classic 1954 play “Twelve Angry Men,” a courtroom drama written by playwright Reginald Rose in which a dozen jurors decide the fate of a young man accused of murder. What will the verdict be? This suspenseful (and occasionally funny) thriller pits passionate jurors against one another in a surprisingly timely examination of the American justice system while exploring personal prejudices that society still grapples with today. Rose wrote “Twelve Angry Men” after his stint on jury duty in New York. His well-written play obviously struck a nerve: he won an Emmy Award for the TV version of “Twelve Angry Men,” and received an Academy Award nomination for the 1957 film version starring Henry Fonda. The Laguna Playhouse production, which runs through Oct. 22, features 12 actors who have a variety of TV, stage and film work in their thespian hats, experience that lends itself well to the challenges of a single-set drama that was penned more than 60 years ago. It was with great anticipation that we nine theater lovers took our seats as the lights dimmed. We were not disappointed—in fact, you could say we were thrilled by the production, which runs 100 minutes with no intermission so the tension remains high the entire time. We, and the rest of the nearly sold-out audience, gave the performance a hearty standing ovation at its conclusion. We strolled downtown to the Lumberyard restaurant to grab dinner and discuss the play. We agreed that it was a fabulous production, mainly because the actors created convincing characters and the play built in suspense minute by minute. We also agreed that the themes of racial intolerance and bigotry that crept into the play are unfortunately as timely now as they were in the 1950s. Lumberyard was also a hit. We ordered the famous planks (deep fried zucchini) to start, then a variety of salads, burgers, meatloaf and ahi tuna sandwiches. The portions are so generous at Lumberyard that several people in our group asked for doggie bags, which means our spoiled dogs got even more spoiled that night. Tickets are $45 – $80 and can be purchased online at lagunaplayhouse.com or by calling (949) 497-ARTS (2787). Group rates are also available; tell them the Nine Neighbors sent you.